t was Prince Elector Ruprecht III (1398 - 1410) who had erect the first representative building as a regal residence in the inner courtyard. The exterior of the building, divided into a ground floor made of stone and framework upper levels, seems quite unpretentious today. 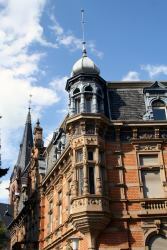 Another regal building is located opposite to the Ruprecht Building: the Fountain Hall. Prince Elector Philipp (1476 - 1508) is said to have arranged the transfer of the hall’s columns from a decayed palace of Charlemagne to Heidelberg. The Prince Electors of the 16th and 17th century turned the fortress into a castle and added two representative palace buildings to the complex. The two dominant buildings at the eastern were erected during the rule of Ottheinrich (1556 - 1559) and Friedrich IV (1583 - 1610). Today, they are considered to be two of the most important buildings in German architectural history. Under Friedrich V (1613 - 1619), the main building of the Westside was erected, the so called "English Building". The Castle and its garden were destroyed, during the 30 Years' War. Later, it was rebuilt by Prince Elector Karl Ludwig (1649 - 1680), only to be destroyed once again by French troops. Prince Elector Karl Theodor who resided in Schwetzingen tried to restore the castle to make it inhabitable once again, but in vain: Lightning struck the Castle in 1764. In the centuries that followed, the Castle was misused as a quarry - castle stones helped to build new houses in Heidelberg. This was stopped in 1800 by Count Charles de Graimberg who made any effort he could to preserve the Heidelberg Castle. In spite of its Gothic interior, it was not before 1934, that the King’s Hall was added. The beautiful old castle dominates the Heidelberg skyline, looming over the old town. Heidelberg Castle (mainly 14th-17th century), one of the most impressive historic landmarks of Germany, called the red walled castle. The structure, now largely in ruins, preserves numerous examples of medieval, Renaissance, and baroque German architecture. Of particular interest are the four granite columns located in the castle courtyard, which were once part of a castle belonging to Charlemagne. The cellar of Heidelberg Castle contains the famed Heidelberg Tun, a wine vat with a capacity of 220,017 litres (58,124 gallons). The present day barrel was constructed in 1751 from 130 oak tree trunks, It is 8.5 meters across and 7 meters high with a dance floor on top. It was built under Karl Theodor, a baroque plaque bears his initials. The old town doesn't cover a particularly large area, so there's no chance of you getting lost. The best starting point for your exploration of the old town is probably Bismarckplatz. From Bismarckplatz walk down the pedestrian's Hauptstrasse (high street). This is the main shopping street in Heidelberg and you'll find plenty of opportunities to pick up some souvenirs or stop for a coffee/bite to eat. The University Library is the main library of the University of Heidelberg (Ruprecht-Karls-Universität) library system, serving about 24,000 students. The library also provides literature and information for other institutions of higher learning in Heidelberg (Teacher training academy, University for Jewish Studies) as well as for users in both the city of Heidelberg and the surrounding region. The university library is a member of both German and international interlibrary loan set-ups and serves as a partner for other libraries in the area of Heidelberg. Schwetzingen is a small town 12 KM to the west of Heidelberg. You can get to Schwetzingen with either a very pleasant cycle ride or by car on the motor way. Schwetzingen is famous for its extensive castle gardens. The castle isn't really much of a castle, but rather a large palace. Half way between Heidelberg and Weinheim you'll find the town of Schriesheim. This is a nice little town with a Castle overlooking it from above. The Castle actually contains a lovely restaurant with an outside terrace with a terrific view. You can sit out there and have a drink or a meal. The Max Planck Institute for Medical Research (MPImF) was established in 1929 by Ludolf von Krehl in Heidelberg, Germany. Originally called the Kaiser Wilhelm Institute for Medical Research, it was one of the first institutes in the world to apply the disciplines of chemistry, physiology, pathology and physics toward biomedical research. During the 1930s, it was one of the most dynamic laboratories in all of Germany, with seven eventual Nobel Prize winners working there during this time - three of them as heads of the four research programs. The Rise of National Socialism and onset of the Second World War seriously undermined Krehl's multidisciplinary vision. Reorganized under the umbrella of the Max Planck Society in 1948, the Institute returned to its previous level of productivity during the 1950s and 1960s. During the next two decades, the MPImF evolved dramatically, adding modern molecular and structural biology into the mix of chemistry, biochemistry and physiology. Research highlights over the years have included major contributions to the analysis of the first metabolic pathway - glycolysis, a broad range of breakthroughs involving muscle biochemistry and structure, elucidation of the bioenergetics role of ATP, and unravelling of the mechanisms of cell regulation and DNA replication. Some of the earliest chemical studies of vitamins, anti-bacterial agents, biological resistance and toxicology were performed at the institute, as well as important theoretical work in the fields of organic and physical chemistry. Fundamental discoveries in nuclear physics were made here and MPImF scientists pioneered the development of synchrotron radiation for biological research.